The game is set in the Hanlin Academy in Ming dynasty China. Most students are members of the Grand Secretariat of the Hanlin Academy, the body of top-ranking graduates of the civil service examination who serve as advisers to the Wanli emperor. Some Grand Secretaries are Confucian "purists", who hold that tradition obliges the emperor to name his first-born son as successor; others, in support of the most senior of the Grand Secretaries, maintain that it is within the emperor's right to choose his successor; and still others, as they decide this matter among many issues confronting the empire, continue to scrutinise the teachings of Confucianism for guidance. The game unfolds amidst the secrecy and intrigue within the walls of the Forbidden City, as scholars struggle to apply Confucian precepts to a dynasty in peril. Daniel K. Gardner is the Dwight W. Morrow Professor of History at Smith College and the author of many books and articles on the Confucian and Neo-Confucian tradition in China. 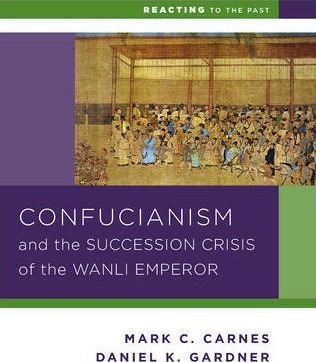 His most recent books are The Four Books: The Basic Teachings of the Later Confucian Tradition and Confucianism: A Very Short Introduction (forthecoming). Mark C. Carnes is professor of history at Barnard College and creator of Reacting to the Past. He is the author of many books in American history and general editor of the 26-volume American National Biography, published by the ACLS and Oxford University Press.